Some years ago I used to make a habit of spending a fair few summer Saturdays and particularly Sundays at the Lincolnshire coast in and around the little east coast resort of Sutton on Sea. It’s perhaps a lesser-known destination compared to other larger and more well-used Lincolnshire seaside towns such as Skegness and nearby Mablethorpe but much more to my liking with it’s lack of over-commercialisation, relaxed atmosphere and olde-world charm. In an era when the things we’re familiar with seem to change on a daily or weekly basis, it’s a refreshing and slightly reassuring sensation to understand that something remain much the same and this was my feeling upon wandering through Sutton again after an absence of a few years. Still there are the little Maple Leaf shaped children’s paddling pool, the Beach Hotel and the tried and trusted excellent Dolphin fish and chip shop on the High Street. Most of all that magnificent long stretch of sandy beach stretching as far as the eye can see remains with it’s twice-daily high tide spreading up towards the seawall. The day we visited showed a sparse amount of people on the beach under a pleasant July sky, perhaps reflecting that this particular Sunday was World Cup Final day in South Africa. An irregular trickle of holiday makers combed the edge of the waters lapping up onto the golden sands as we felt that ultimate relaxation that only a sunny beach with the sound of the sea can seem to bring. Before that though there was a run of a few miles along the pleasant promenade to return by the water’s edge. Running can never be a chore in such lovely distracting circumstances. All good things inevitably come to an end and all too soon it was time to drag ourselves from the beach and it’s early evening sunshine, change and go home. We had not seen the end of a lovely day though as we detoured through the city of Lincoln on the way home and alighted the car adjacent a Roman excavation near the famous Cathedral. A pleasant walk along the historic Bailgate area and into Steep Hill took us along to the attractive Wig and Mitre pub to take stock of a successful day in the sun, over a sandwich and a drink. The perfect end to a lovely day. I love that beech photo. Thanks Shell. Unfortunately only a day trip. 🙂 Hopefully some more sunny weather will prevail and give an opportunity for another nice visit! Thanks for your nice remarks Helene. Nice to see a bit of interest in the World Cup in the US! Although relatively young I still find North American history interesting. 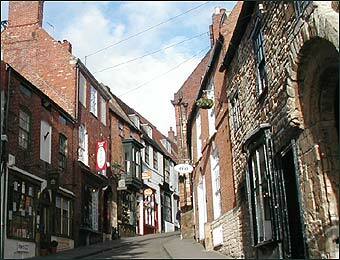 The ‘village’ scenes are from Lincoln which is actually a small city!